Read this and you can finally stop smiling and nodding at Capitol Hill dinner parties. Campaign finance regulation is a maze. It's a labyrinthine system with seemingly ever-changing rules for disclosure, donation limits, and what qualifies as "independent expenditures." A super PAC set up solely to support one candidate would swear that, no, it has no specific interest in one candidate over the other. This type of smoke-and-mirror show is exactly why trying to understand how campaigns are financed can be so vexing. Even campaign finance lawyers we spoke with for this story — people who deal with these regulations every day — have disagreements about how exactly to interpret, well, anything. Here, we break down that system to show the many ways individuals can donate — directly or indirectly — to benefit the presidential candidate of their choice. How much can one well-heeled philanthropist spend to influence the outcome of a presidential election over the course of a year? Below is our answer, and an exhaustive guide to all of the groups hoping to vacuum up donors' money over the next year and a half. A helpful way to think of leadership PACs is as proto-campaign funds. Before a politician announces a presidential run, she can set up a leadership PAC to start collecting money and laying the groundwork for an eventual campaign. Individuals can donate up to $5,000 a year to a leadership PAC, but the PAC's beneficiary cannot turn around and use that money on her own campaigns — at least, not directly. While pols can't use leadership PAC funds to directly campaign for themselves, they can use the money to build national recognition. For example, when Sen. Rand Paul traveled to Guatemala in August to perform pro bono eye surgeries — a trip that netted him a fair amount of positive media coverage — his leadership PAC funded it. After a candidate officially declares a presidential run, the function of his leadership PAC becomes largely obsolete. Once a politician officially declares his or her candidacy, that's when campaign committees come into play. When most people think of what "donating to a political campaign" means, they probably think of the campaign committee. This is the most direct type of campaign donation, but it is almost quaint in its limitations compared with the dark-money behemoths that dominate political fundraising today. Under new Federal Election Campaign guidelines, individual donations are limited to $5,400 per two-year cycle — $2,700 to be used for the primary election, and $2,700 for the general election, should the candidate be lucky enough to win his party's nomination. While state and national parties typically remain on the sidelines during primaries, they will spring into action to benefit their side's candidate in the general election. Those $50,000-a-plate dinner fundraisers organized by joint fundraising committees, for example, usually funnel contributions to both the state and national arms of a party. Before last April, individuals could donate only a combined $123,000 to all federal political committees. But in its decision in McCutcheon v. FEC last year, the Supreme Court struck down that aggregate limit. That means individuals can now give a combined $10,000 to state, district, and local party committees in all 50 states — in other words, a maximum of $500,000 each calendar year. However, donors may find a better return on investment if they spend money in a few key swing states rather than give to, say, the California Republican Party or the Texas Democratic Party. Under the new Federal Election Committee limits, individual donors can give $33,400 every calendar year to a national party's three committees: the national committee, the Senate campaign committee, and the House campaign committee. While the money you give to the Republican National Committee or the Democratic National Committee during election season will largely be spent to benefit that party's presidential nominee, donating to a House or Senate campaign committee is less likely to help out your presidential candidate of choice. The purpose of parties' convention accounts, unsurprisingly, is to raise money to pay for each party's national nominating convention. As with the national party accounts, individuals can donate $33,400 to the national committee and the party's two congressional committees — a total limit of $100,200 per year, according to the FEC. There is some uncertainty, however, over the real limits for these funds. The "CRomnibus" funding bill that Congress passed in December included a provision (on page 1,599 out of 1,603) that increased the limit individuals can donate to party convention accounts, along with the headquarters account and the legal expense account. Paul S. Ryan, a senior counsel at the Campaign Legal Center, told National Journal that could mean the actual contribution limit for those three funds is now $300,600. The FEC has yet to issue additional guidance, so for now those donation limits are in legal limbo. This type of account — which also benefited from the CRomnibus rider — is meant to pay for brick-and-mortar costs for the national parties. Think of it as a start-up fund. This is the fund that political parties can use to pay the legal costs for election recounts or other election-related litigation. Host committees are nonprofit funds for the cities hosting the national Republican and Democratic conventions. While these funds mainly attract corporate sponsors looking to curry favor with either party, some wealthy individuals donate to them as well. The money raised can be spent on anything from outfitting the convention center to hosting "hospitality" events (i.e., parties). 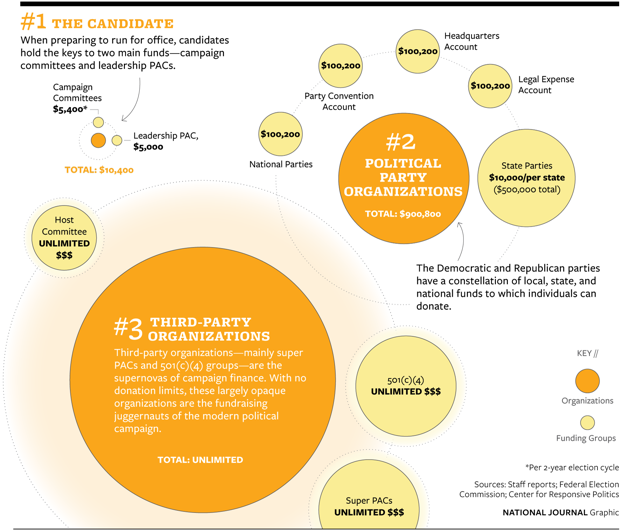 Super PACs can raise and spend an unlimited amount of money on their political cause of choice. However, they are somewhat limited in how they can spend that money. They cannot explicitly advocate for or against a candidate's election — that's why many super PAC ads employ open-ended questions or negative character judgments while stopping short of telling viewers not to vote for someone. Super PACs are also not supposed to coordinate with a candidate on his or her campaign. Of course, the organizations have found clever ways to indirectly coordinate with the candidates they support, whether through awkward YouTube clips or dummy Twitter accounts. Social-welfare groups known as 501(c)(4)s (or simply C 4's, for short) are the new frontier of political fundraising. As National Journal's Shane Goldmacher recently wrote, these groups will "make super PACs look quaint" in 2016. Before the Supreme Court's Citizens United decision in 2010, these nonprofit corporations were prohibited from airing overtly political ads. Now, they are allowed to spend up to 49.99 percent of their money on express candidate advocacy — such as TV advertising that explicitly tells viewers to vote for or against a candidate. They must spend the other 50.01 percent of their money on "issue advocacy." As with super PACs, however, the line between express advocacy and issue advocacy can often blur. The biggest difference between C4's and any other organization that raises money for political purposes is that they do not have to disclose their contributions, or who gave them. That means they operate largely in the dark, out of the public eye. One example is Crossroads GPS, the social-welfare arm of the conservative super PAC American Crossroads. The Sunlight Foundation found that American Crossroads and Crossroads GPS spent a combined $174 million on the 2012 election, and that 70 percent of the contributions were from anonymous donors. It's a brave new world.